Harmless, Virtual hybrid synth from Image Line. 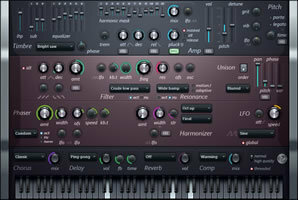 Image Line has announced the release of Harmless, a new additive synthesizer doing subtractive synthesis. 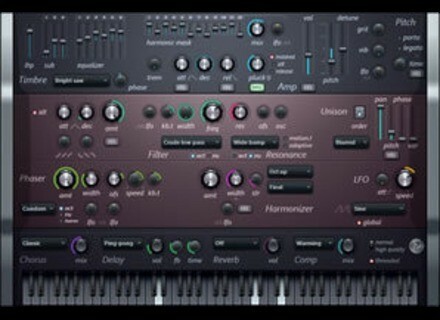 Or if you prefer, a subtractive synthesizer powered by an additive synthesis engine. Harmless is designed to allow fine control that wouldn't be possible through classic subtractive synthesis, according to the company. Filtering and phasing can be assigned unusual shapes & slopes, something normally only possible through offline digital filters. Filter slopes can even be defined in Hz instead of octaves. Finally, you get control on each partial's frequency, creating timbres definitely impossible using common synthesis methods, they say. Harmless was limited by design. No tabs, no hidden controls, no multi-point envelopes. All features are visible at once, and color-grouped. Over 100 parameters, most of which being automatable, are laid over the GUI. Under the hood, you will find unique options, like linking the phaser's output to partials frequencies. The LFO section can act as a special modulation source, linking the phaser's width to the velocity, or the pitch to the filter's envelope. Harmless also offers features typically unique to additive synthesis, like its automatable harmonic mask. Effects include the usual chorus, delay & reverb, as well as a multi-band compressor/limiter powered by Maximus itself. Harmless is available for Windows as VST instrument and FL Studio plug-ins and can be yours for as little as $9 - until the 31st of December you can pay what you think Harmless is worth to you with a minimum to cover the transaction fees and handling. Goldbaby Productions MPC60 Vol. 3 This is the last in the MPC60 series of sample packs - It includes: Layered Drums, Vinyl Drums, Various Drum Machines, FX, and some synth sounds. Wok Tonmeister WOK has announced the release of Tonmeister, a force-to-scale MIDI effect plug-in - it forces incoming MIDI notes to the selected scale and root key.